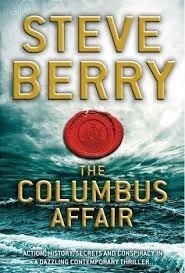 I am currently reading The Fast Paced Historical Novel The Columbus Affair by Steve Berry. It Concerns A mysterious and ruthless Austrian Jewish billionaire named Zachariah Simon, Jamaican crime lord Béne Rowe , eminent international politicians, and a covert arm of the American government, who are all linked by a single puzzling possibility concerning Christopher Columbus. Five hundred years after his fourth and last voyage to the New World. They are convinced there was more to the voyage and that he knew the secret location of a gold mine in Jamaica. So they coerce troubled Pulitzer Prize Winning ex-investigative journalist turned Ghostwriter Tom Sagan into helping them, by kidnapping his bitter estranged Daughter Alle Beckett and threatening to kill her if he refuses to help. Tom was highly respected journalist who wrote hard-hitting articles from trouble spots around the world until one of his stories from The Middle East is exposed as a fraud, and he suspects that his downfall was a deliberate act of sabotage by an unknown enemy. Sagan’s actions soon attract the attention of Brian Jamison, who says he’s an American intelligence officer from the Magellan Billet,a top-secret corps of the United States Justice Department which deals with America’s most sensitive investigations. They also interest Frank Clarke, of the Charles Town Council of Elders; and the 102-year-old Rabbi Berlinger, of Prague’s Old-New Synagogue, who’s convinced that the apostate Tom is the latest Levite. Before long Sagan finds himself caught in an international incident, And is Coaxed into a deadly game of cat-and-mouse, Which leads him to Vienna, Prague, then finally into the Blue Mountains of Jamaica where he makes a shocking discovery. After Staffell’s departure in 1970. Mercury himself joined the band shortly thereafter, changed the name of the band to “Queen”, and adopted his familiar stage name. John Deacon was recruited prior to recording their eponymous debut album (1973). Queen enjoyed success in the UK with their debut and its follow-up, Queen II (1974), but it was the release of Sheer Heart Attack (1974) and A Night at the Opera (1975) that gained the band international success. The latter featured “Bohemian Rhapsody”, which stayed at number one in the UK Singles Chart for nine weeks; it charted at number one in several other territories, and gave the band their first top ten hit on the US Billboard Hot 100. Their 1977 album, News of the World, contained two of rock’s most recognisable anthems, “We Will Rock You” and “We Are the Champions”. By the early 1980s, Queen were one of the biggest stadium rock bands in the world, and their performance at 1985′s Live Aid is regarded as one of the greatest in rock history. In 1991, Mercury died of bronchopneumonia, a complication of AIDS, and Deacon retired in 1997. Since then, May and Taylor have infrequently performed together, including a collaboration with Paul Rodgers under the name Queen + Paul Rodgers which ended in May 2009.The band have released a total of 18 number one albums, 18 number one singles, and 10 number one DVDs. Estimates of their album sales generally range from 150 million to 300 million albums, making them one of the world’s best-selling music artists. They received a Lifetime Achievement Award from the British Phonographic Industry in 1990, and were inducted into the Rock and Roll Hall of Fame in 2001. World renowned French artist Edgar Degas was born 19th July 1834 in Paris. He is famous for his work in painting, sculpture, printmaking and is regarded as one of the founders of Impressionism although he rejected the term, and preferred to be called a realist. A superb draftsman, he is especially identified with the subject of the dance, and over half of his works depict dancers. These display his mastery in the depiction of movement, as do his racecourse subjects and female nudes. His portraits are notable for their psychological complexity and depiction of human isolation.